A fish biologist shares what he loves most. I ENJOY PICTURES of big fish and hearing tales about catching big fish in places like Alaska, Montana and even Utah’s renowned Blue Ribbon trout waters. But one thing that thrills me as much as anything is cutthroat trout in their native streams, most of which happen to be small (both the streams and the trout). A Colorado River cutthroat trout in the Uinta Mountains. I’m a DWR fish biologist in northern Utah, and I am absolutely captivated by cutthroat trout. In my job I work primarily with native cutthroat trout, so I’m constantly thinking about cutthroat trout and projects that will improve their populations. Almost daily during the summer, I get to visit their haunts, hold them in my hands, and be reminded of their magnificence and the beautiful places they live. As a biologist I most often look at things from a biologist’s point of view, but that’s really not what this post is about. Several years ago I went camping near a small stream in southern Utah. I knew before I went that the stream held a population of Bonneville cutthroat trout, so I decided to take some fishing gear and spend as much time as I could fishing for those cutthroats. The time spent fishing didn’t amount to much, but the fishing was incredible! Dropping a fluffy dry fly onto the surface of a small pool and watching a trout burst from its hiding place to quickly devour the fake bug was a thrill. It’s amazing what a memory can do — I just relived those heart-pounding moments! A couple years ago I returned to that same stream with a buddy to fish for those trout again. It was even more thrilling than before, having gained a greater appreciation for cutthroat trout in the meantime. In fact, shortly after the first experience on that stream I started tying flies, and using flies I tied myself made the second trip even more fulfilling. A cutthroat trout enticed by a caddis fly imitation. Later that summer the same friend and I fished a small stream in northern Utah for cutthroat trout. Different place, different population of cutthroat trout, but same outcome; I was thrilled once again by cutthroat trout in a small stream. And my own version of an elk hair caddis was all they needed! The great thing is these aren’t isolated incidents, and they aren’t to be had only in isolated or remote places. 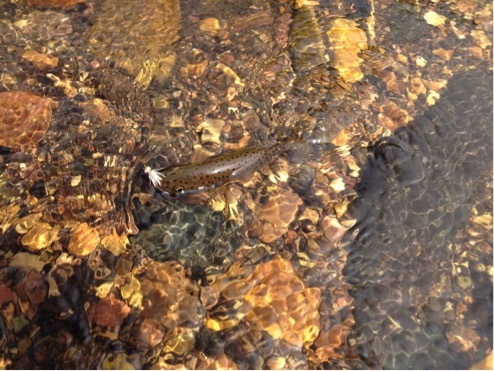 In northern Utah, cutthroat trout can be found relatively close to the Wasatch Front. But if isolation is what you prefer, you can drive a few hours and then even hike a few more to catch cutthroat trout, like the one in the photo below. Either way, you’re sure to have an experience you’ll never forget. And it’s really not difficult to do. Cutthroat trout in small streams are usually very willing to take a fly or lure, since in most cases they haven’t seen the number of artificial flies or lures that fish in larger creeks and rivers have seen. All you need is some fishing gear, a current fishing license and a place to go. 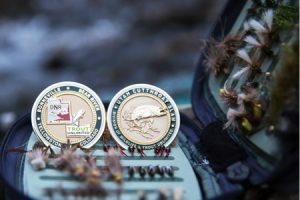 Complete Utah’s Cutt Slam and earn a medallion. 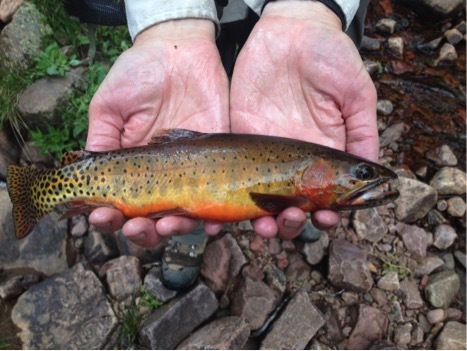 If you’re up for the challenge of catching all four of Utah’s native cutthroat trout, you should register for the Utah Cutthroat Slam, the new program promoting awareness and conservation of Utah’s native trout. If you complete the Slam, you’ll receive a nice certificate celebrating your achievement and, even better, a commemorative medallion! Good luck, and enjoy Utah’s beautiful cutthroat trout and the amazing places they live! What awesome fish. If only we got them downunder…..